The most handsome boy, Trevor, had been a stray for a few months before coming into CP care in August 2014. He was rather disgruntled at being confined in a pen though we thought there was an 'inner soft ie' in him, it just needed the right people to discover it. Very happily, Barbara & Fred saw Trevor on the website and decided he was the one for them immediately. 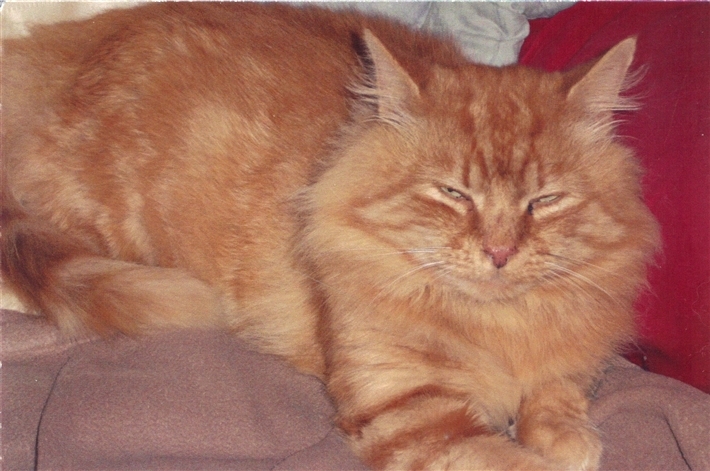 His unpredictable nature didn't deter them and Trevor went to his new home in early October. A week after adoption it was lovely to hear and see that Trevor is a reformed character and has all the makings of a lap cat! Sometimes things are just meant to be and that the perfect owner is out there.